The source code for this post has been updated to VS 2017 (master branch). There is also a VS2015 branch for Visual Studio 2015. 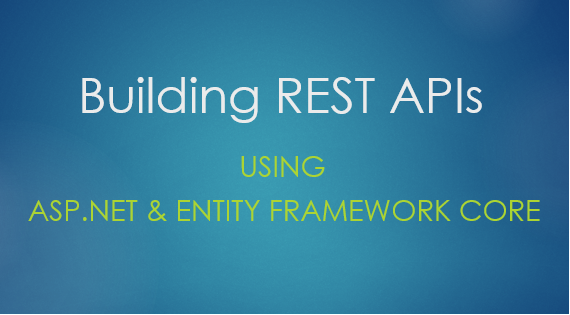 ASP.NET Core and Entity Framework Core are getting more and more attractive nowadays and this post will show you how to get the most of them in order to get started with building scalable and robust APIs. We have seen them in action on a previous post but now we have all the required tools and knowledge to explain things in more detail. One of the most key points we are going to show on this post is how to structure a cross platform API solution properly. On the previous post we used a single ASP.NET Core Web Application project to host all the different components of our application (Models, Data Repositories, API, Front-end) since cross-platform .NET Core libraries weren’t supported yet. This time though we will follow the Separation of Concerns design principle by spliting the application in different layers. The purpose of this post is to build the API infrastructure for an SPA Angular application that holds and manipulates schedule information. We will configure the database using Entity Framework Core (Code First – Migrations), create the Models, Repositories and the REST – MVC API as well. Despite the fact that we ‘ll build the application using VS 2015, the project will be able to run in and outside of it. Let’s denote the most important sections of this post. In the next post will build the associated Angular SPA that will make use of the API. The SPA will use the latest version of Angular, TypeScript and much more. More over, it’s going to apply several interesting features such as custom Modal popups, DateTime pickers, Form validations and animations. Just to keep you waiting for it let me show you some screenshots of the final SPA. Are you ready? Let’s start! Assuming you have already .NET Core installed on your machine, open VS 2015 and create a blank solution named Scheduler. Right click the solution and add two new projects of type Class Library (.NET Core). Name the first one Scheduler.Model and the second one Scheduler.Data. You can remove the default Class1 classes, you won’t need them. Continue by adding a new ASP.NET Core Web Application (.NET Core) project named Scheduler.API by selecting the Empty template. 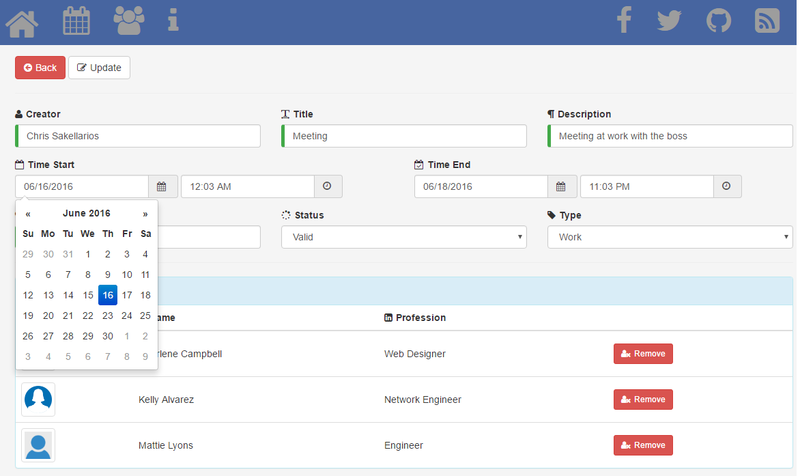 Add a .cs file named IEntityBase which will hold the base interface for our Entities. As you can see there are only three basic classes, Schedule, User and Attendee. Our SPA will display schedule information where a user may create many schedules One – Many relationship and attend many others Many – Many relationship. We will bootstrap the database later on using EF migrations but here’s the schema for your reference. Continue by creating the repositories in a new folder named Repositories. Since we want to use Entity Framework to access our database we need to create a respective DbContextclass. 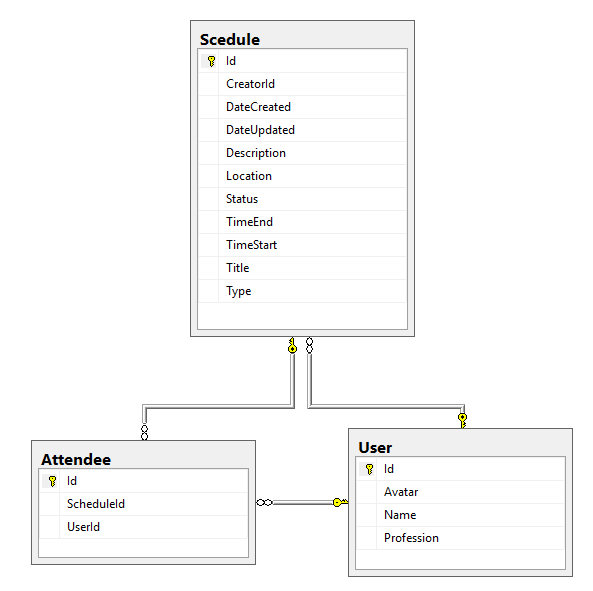 Add the SchedulerContext class under the root of the Scheduler.Data project. Before moving to the Scheduler.API and create the API Controllers let’s add a Database Initializer class that will init some mock data when the application fires for the first time. You can find the SchedulerDbInitializerclass here. We referenced the previous two projects and some tools related to Entity Framework cause we are going to use EF migrations to create the database. Of course we also referenced MVC Nuget Packages in order to incorporate the MVC services into the pipeline. Modify the Startup class..
// This reads the configuration keys from the secret store. // Add MVC services to the services container. // Add MVC to the request pipeline. 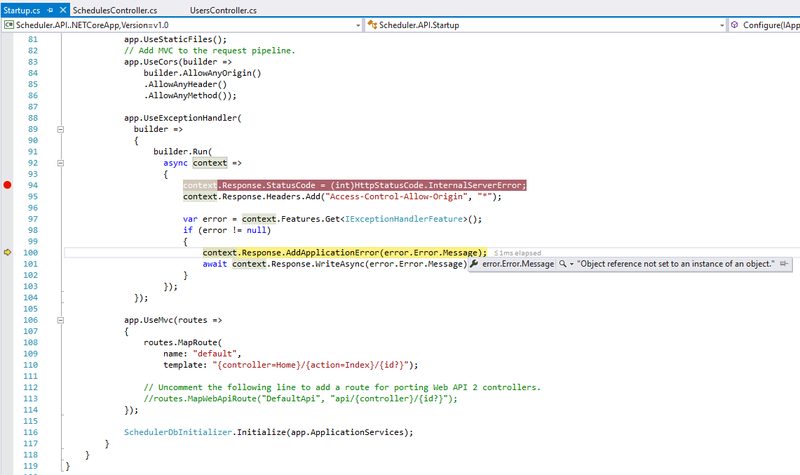 // Uncomment the following line to add a route for porting Web API 2 controllers. We may haven’t created all the required classes (dont’ worry we will) for this to be compiled yet, but let’s point the most important parts. There is a mismatch between the project that the configuration file (appsettings.json) which holds the database connection string and the respective SchedulerDbContextclass leaves. The appsettings.json file which we will create a little bit later is inside the API project while the DbContext class belongs to the Scheduler.Data. If we were to init EF migrations using the following command, we would fail because of the mismatch. dotnet ef migrations add "initial"
What we need to do is to inform EF the assembly to be used for migrations..
We have added Cors services allowing all headers for all origins just for simplicity. Normally, you would allow only a few origins and headers as well. We need this cause the SPA we are going to create is going to be an entire different Web application built in Visual Studio Code. One thing I always try to avoid is polluting my code with try/catch blocks. This is easy to accomplish in ASP.NET Core by adding a global Exception Handler into the pipeline. Create an appsettings.json file at the root of the API application to hold you database connection string. Make sure you change it and reflect your environment. It’s good practise to send a parsed information to the front-end instead of using the database schema information. Add a new folder named ViewModels with the following three classes. When posting or updating ViewModels through HTTP POST / UPDATE requests to our API we want posted ViewModel data to pass through validations first. For this reason we will configure custom validations using FluentValidation. Add a folder named Validations inside the ViewModels one and create the following two validators. Add a new folder named Mappings inside the ViewModels and set the Domain to ViewModel mappings. Add a new folder named Core at the root of the API application and create a helper class for supporting pagination in our SPA. I decided on this app to encapsulate pagination information in the request/response header and only. If the client wants to retrieve the 5 schedules of the second page, the request must have a “Pagination” header equal to “2,5”. All the required information the client needs to build a pagination bar will be contained inside a corresponding response header. The same applies for custom error messages that the server returns to the client e.g. if an exception occurs.. through the global exception handler. Add an Extensions class inside the Core folder to support the previous functionalities. The SPA that we ‘ll build on the next post will render images too so if you want to follow with me add an images folder inside the wwwroot folder and copy the images from here. The only thing remained is to create the API MVC Controller classes. Add them inside a new folder named Controllers. At this point your application should compile without any errors. Before testing the API with HTTP requests we need to initialize the database. In order to accomplish this add migrations with the following command. For this command to run successfully you have two options. Either open a terminal/cmd, and navigate to the root of the Scheduler.API project or open Package Manager Console in Visual Studio. In case you choose the latter, you still need to navigate at the root of the API project by typing cd path_to_scheduler_api first..
Next run the command that creates the database. Fire the Web application either through Visual Studio or running dotnet run command from a command line. The database initializer we wrote before will init some mock data in the SchedulerDb database. 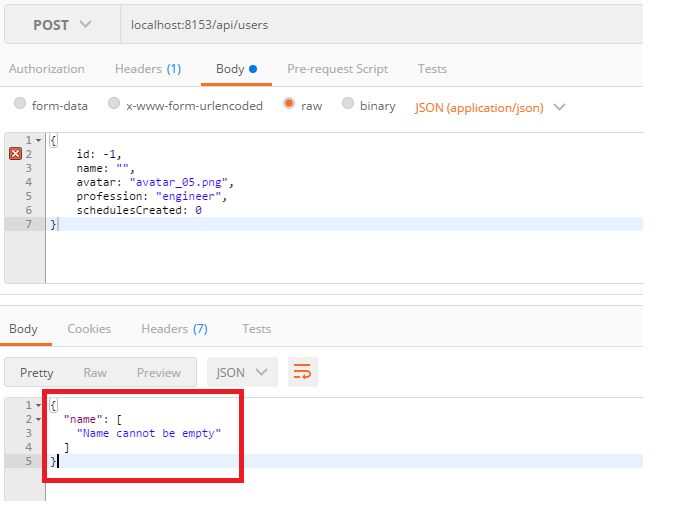 Sending a simple GET request to http://localhost:your_port/api/users will fetch the first 6 users (if no pagination header the 10 is the pageSize). The response will also contain information for pagination. 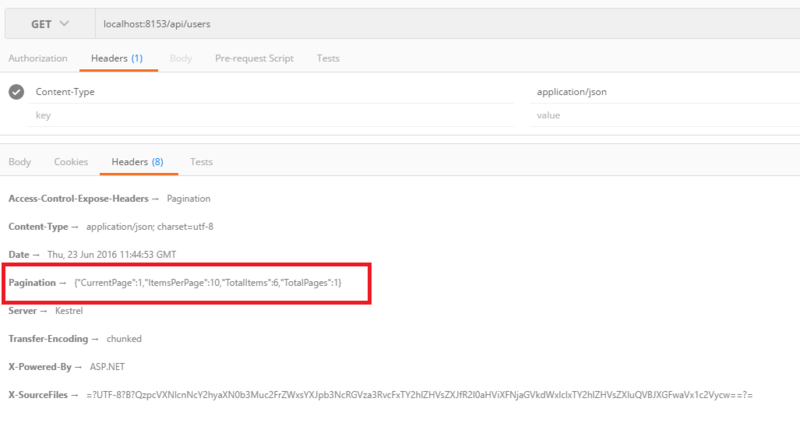 You can request the first two schedules by sending a request to http://localhost:your_port/api/scheduleswith a “Pagination” header equal to 1,2. Two of the most important features our API has are the validation and error messages returned. This way, the client can display related messages to the user. Let’s try to create a user with an empty name by sending a POST request to api/users. As you can see the controller returned the ModelState errors in the body of the request. 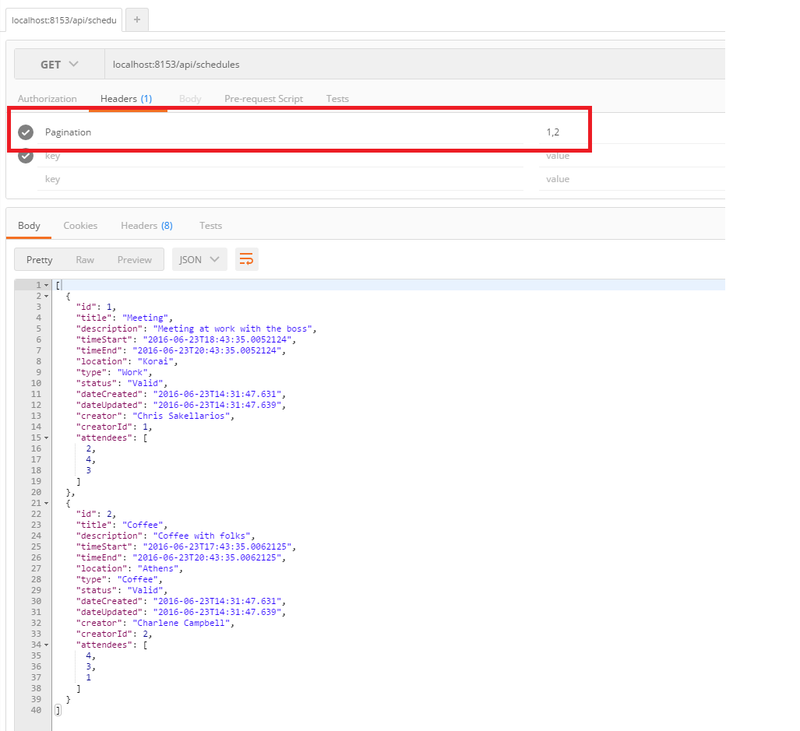 I will cause an exception intentionally in order to check the error returned from the API in the response header. 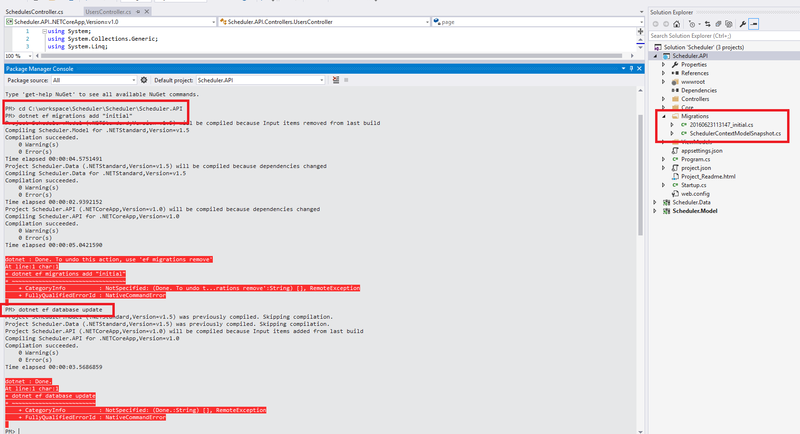 The global exception handler will catch the exception and add the error message in the configured header. We have finally finished building an API using ASP.NET Core and Entity Framework Core. We separated models, data repositories and API in different .NET Core projects that are able to run outside of IIS and on different platforms. Keep in mind that this project will be used as the backend infrastructure of an interesting SPA built with the latest Angular version. We will build the SPA in the next post so stay tuned! Source Code: You can find the source code for this project here where you will also find instructions on how to run the application in or outside Visual Studio.